I’m only human… – …STILL CRAZY AFTER ALL THESE YEARS! A car is like a human being too. When it is new and flashy, it will look great and will be the envy of all. People will admire and sing its praises and everything will run smoothly. However, it will grow old too – time will take its toll and problems may crop up time and again. However, if one takes good care of oneself from young and eat the right diet and have proper nutrition, stay away from all bad habits, go for regular check-ups and keep oneself active, one should be in pretty good shape once one grows old. Many people do not take good care of their cars – as long as it runs, it’s fine. In Hokkien, they refer to this as oo cho, boh ciak (direct translation: got do/work, no eat) and of course, it would come as no surprise that trouble would come knocking on one’s door. I drive to Selangau and beyond once a week and very often, I would see cars breaking down, stalled by the side of the road and some of them are actually very new…not to mention, those with a flat tyre! I guess they feel it is not too far, just an hour and a half away (even though there is nothing much all along the way other than a few longhouses and jungle, trees, trees and more trees), so they never bother to make sure their cars are in tip-top shape before embarking on the journey. Every week, I would make it a point to fill up the petrol tank, check the air pressure in the tyres including the spare in the boot, check the engine oil, the battery water, the water in the radiator and the storage tank for the wipers/windscreen…and of course, every 5,000 km, I would send the car to the mechanic to change the engine oil and get him to look at everything to make sure everything is in perfect running order. …like this old car of mine, already 20 years old and is in pretty good shape, I would say. Of course, it’s a manual but that is not a problem here. People tell me that it would be tough not driving an auto-gear vehicle in KL with all the horrendous jams all over and having to shift gear all the time for hours on end when they get caught in one. …so I really have no complaint whatsoever plus an old man like me sure doesn’t need to show off and drive a flashy car, zooming down our two-minute streets (yes, it takes two minutes or less to drive from one end of our roads to the other unless you go out of town, like me…and I can’t for the dear life of me understand why they need to go so fast) and parking the beauty illegally by the road side outside the coffee shops, flaunting away for all to see. Yes, yes, I know. Old cars have no resale value. Neither have humans. Imagine if I were to go and ask for a job now, people would just laugh it off saying, “We can’t afford you lah!! !” when deep down inside, they’re actually whispering to themselves, “Who wants to employ you, you old goat?” Just look at the recent Budget, for instance – civil servants will get a bonus, 50% of their salaries, but sorry, no 50% for pensioners. We will get RM250.00, that’s all, and even that, we will have to wait till January! It is pretty obvious, isn’t it? They think we are not actively contributing anymore, never mind what contributions we might have made during our years of service…and it does seem quite clear that they can’t wait for us to kick the bucket and join the heavenly choir so they will not have to pay us our measly pensions anymore. Tsk! Tsk! …though – my 24-year old 1st generation Saga. No, no, there’s nothing wrong with it…just that, both my missus and I are no longer working so we do not need two cars anymore and this one is hardly ever used (since it’s parked on the inside of the car porch all the time) except when I have gone out and maybe my missus would need to go out for some reason, usually to the shops round the corner to get something. As I did say earlier, humans need to stay active, both physically and mentally or the body tissues and muscles would waste away and they will start becoming forgetful and eventually, senile…and similarly, if you do not use your car regularly, it is not good for it at all. I had a problem with this one as like all those national cars from that time, they would rust…badly and it did not help one bit that my missus used to work shifts so it was left outside in the sun, moon and rain day in, day out. The guy at the paint shop said it was like cancer, eating you up inside out and I had to replace the top/cover of the boot as there was a hole going right through it when I got it resprayed two years ago, after my missus retired. It’s the same with humans, isn’t it? If there is a cancerous growth, you may need to go for surgery to remove that problematic part of your anatomy. Actually, between the two, I think this one has more power and the body is much stronger, more solid…but I am more used to the other one since I’ve been driving that one all the time. I went and asked my mechanic and he too told me that I would not get much for it and since it is running well and is not causing any problem, I might as well keep it as a spare. Sigh!!! I guess I will just hang on to it…or both, actually, till they decide for whatever reason to call it a day and then I can sell it off as scrap metal or something. It’s the same with humans, isn’t it? Once the time comes, they will just send you off to your new home and it’s adios…bye bye!!! Life’s like that, I guess. In my childhood home there is a 86 proton saga still working fine. 28 years old now but still much younger than this human here. You wrote a different type of post today but I still like reading it. Last time Proton has a promotion where you can trade in 1st generation proton for a rebate of RM5k on your new proton so if Melissa ever needs a new car, maybe can trade in the older proton. Yes, will have to do that. There’s only room for two cars in the car porch. Even without a promo, the salesman will do it for you – take it off your hands for 5K, sell for 6 or more…and make a profit there…and that would add to their commission from selling the new car, the commission from your taking up a car loan – that’s how they make enough to get by. But I think the market value for 1st generation Proton is way less than 5K already. 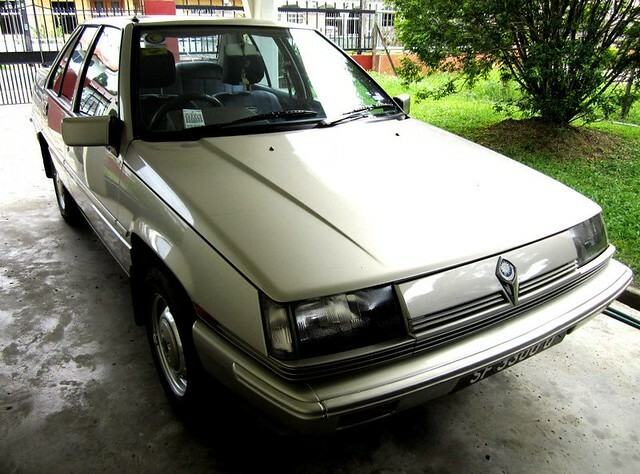 Like Claire, she sold hers for 2.5k only so that time, the Proton promo was quite a good deal. I just had it nicely done, paint works and all for a little over 2K so if I sell it for 2.5, I am virtually giving it away for free. Might as well just keep it as a spare, like the mechanic said. Lots of that this time of the year, nice and cool. I don’t like bills so that is why I have not upgraded mine. It was made in 1998′ runs smoothly, still nice paint job and it stays clean; inside and out. When I do upgrade I’ll get a nice used car and pay it in full, just like I did with this one since I dislike bills. Me too! But I do know of people who will take up a loan to buy a nice new car and pay the instalments monthly for 5 years or so and once the loan has been paid off, they will get rid of it and buy a new one…and pay the instalments for the loan for the new car – just so they can drive around in something nice and new and flashy. Ain’t so bad if they have too much money on their hands…but I know some pay by credit card(s) and pay the minimum every month – very foolish, very very foolish. Nothing wrong with driving an old car as long as we take care of it.. Yep I check my tyres too everyday before I leave for work and I let my hubby check/pump air once a month.. What’s wrong with driving an old car? Lagi baik, no need pay installment already, right..
…and no worries. New car, just a little scratch, so sakit hati. These days, those in the big cars will just open their doors anyhow when parked next to yours…causing dents here and there. I check my tyres at least once every two weeks – will go through the routine of checking everything before driving long distance…which is one and a half hours one way – that, of course, is an everyday thing in KL and Selangor, especially when caught in a jam – quite normal by your standard. My Toyota Corolla has been with me for more than 15 years! Still in good condition. Thanks to my dad who maintain and service it once a while, it seldom break down. I agreed with the mechanic on keeping your car as spare. You never know. Otherwise why dont sell both and trade for a newer car. A 4-wheel? I think a 4-wheel is good option to drive in Sibu considering the bad road condition and flash flood. And more comfortable to drive long distance especially to Selangau. No more flood in Sibu lah, not since Bakun started. Even in those days when it used to flood frequently, my area was not affected, high and dry…so just stayed at home, no problem. 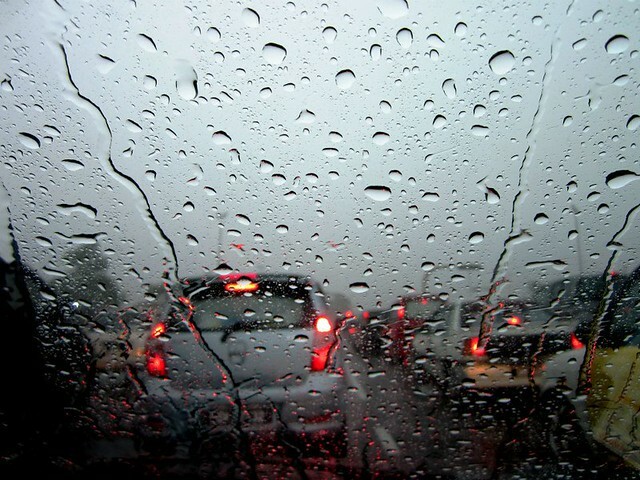 Very bad in Bintulu these days and Kuching too – every time it rains, massive jams all over. They’ve upgraded the road to Selangau right up to my girl’s school, all – except for one or two isolated parts – very nice and smooth like the lane where your house is…unlike that time when you drove to Mukah…or when my girl first got posted there. There are two places with overtaking lanes and they’re working on another one, not that I’m very fond of those as many would all suddenly turn into F1 drivers when they get to those parts. Nice easy drive once a week, much nicer than the roads in some parts of Sibu town proper, actually – just need to be careful when meeting those overloaded timber or oil palm trucks and those inter-town buses…or the Hiluxes and the rest of those vehicles – 9 out of 10 seem to think they’re cats, have nine lives!. It’s because they have no more resale value that you should hold onto them. You won’t lose more money. If you trade in a new car, you will lose money for depreciation again year over year. My main concern is that they’re still good, no problems at all so I do not see a need for a new one. If old and cranky, always causing headaches and heartaches, I would have let them go long ago. Ya, that’s why they say it is better to buy a house than a car – a house appreciates by the day while a car depreciates starting from the moment you drive it out of the showroom. Talking about taking good care of car, I think credit should go to my hub, not me. I think it is high time for me to learn, hehehe. 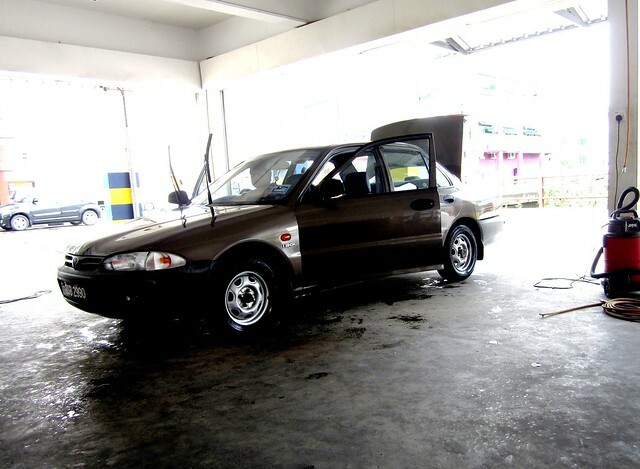 Our Proton Aeroback of 17 years is still in good condition except some minor leakage of oil which we cannot have it done right. Totally agree should have our car check regularly for safety reason. Oil leakage is a serious problem. Change mechanic if yours can’t get it fixed. I’ve had that problem before and the previous mechanic would just tell me – old car like that lah. Used to have lots of problems with my cars, both of them. My present mechanic is very good, very reliable and knows his job well. Now my cars, no problem at all. Very happy. Like doctors, always good to have a second opinion. yea keep it as a second car …back up. Mel not driving? Nope. Not experienced enough to handle outstation driving, the way it is like here…and it has got nothing to do with the road. Yup! I don’t expect to get very much. Those used car dealers would not offer too much as they would find it hard to sell it off at a higher price so they will offer only a little. If they are able to dispose of it at a much higher margin, then it’s their gain. Must consider the risk too – that nobody would want to buy and they would be stuck with it or forced to sell at an even lower price. That’s business, just the way it goes, I guess. Yup! I will always ask my mechanic to be very thorough…and I threaten him that if my car breaks down in the middle of nowhere, I will call him and he will have to come to my aid…never mind how far cos it would be his fault! Hehehehehe!!!! Such a cheerful post, Arthur. Human have no resale value? And I don’t think anyone will call you an old goat. Remember they call you “Ah Hia.” Nothing wrong with old cars. I have one myself — 22 years old and still runs like a dream. Hahahahaha!!!! You’ll never know, maybe things even worse than just “an old goat”! 😀 😀 😀 No more…”Ah Hia”, more ‘Ah Chek”…soon “Ah Pek”, I guess. P.S. You can take the Saga and use when you come back in December – better than just leaving it there, idle most of the time. A good analogy there. If the car is still good, keep it. It is still very useful. You should get a medal for the good maintenance of your car. Some people, not even 5 years and the car is already in bad shape. Yes, sheer neglect. They do not bother to take good care of their cars. Worse if they get involved in accidents. No matter how you patch it up, it will not be the same again. The Wira? That’s brown, and yes, it’s 1.3 only. The Saga is 1.5.
people can replace a car with their money, but no money can bought you time…..
How very true. So take good care from young…and on the road – you only live once. I’m late today! sorry sorry, your car is as old as i am! but i do agree that particular model of saga is very solid and has good performance! We have a university here now. I wonder if there is any student interested in getting an old car. Maybe I can get someone to put up a notice there. It is a good car though, wouldn’t mind keeping it actually…just that we do not need two cars anymore. hahah…nowadays, people usually changed car when it’s reaching 10 years. In SG, it’s a law! People will say after 10 years, the car will start giving all sorts of problems and it’s better to buy a new one than all the maintenance works. You really keep your car well! That’s their government’s way to keep down the number of cars on the road. The license/road tax is so so expensive and then you need to pay through your nose to get whatever certificate that would entitle you to own a car…plus you need to pay to drive into the restricted zones at certain times of day. I guess you drive a JB-registered car? I hear people do that to beat the system? Indeed, my cars are fine, no problem at all. All they need is a little TLC to keep them in tip-top shape. If a lot of maintenance is needed which means money, money, money, I would have let go of them long ago. Cars, or things in general, these days are not made to last – problems will start surfacing the day the warranty expires…and everything’s computerised these days – the moment there is a problem, serving and repairs will be over 1K, don’t play-play (and that’s about half of my monthly pension)…and you can’t go to your usual trusted mechanic, they do not have the equipment…and going to their authorised ones would be like leading the sheep to the slaughter house, so to speak! Last weekend I also sent my car to wash. Late in the evening, a heavy downpour again..
Lots of rain these days but at times, no choice, too dirty already so have to send to the car wash.
Yeah, the first generation Proton Saga is actually quite sturdy and good, it was based on the Mitsubishi Lancer 1983 and there’s practically no difference except for the exterior. I always see you driving the Wira though, like you said we drive what we’re used to. I remember my first car which I bought when I was at my second job… a Proton Satria 1.3 manual, bright red 😀. Had it for almost seven years. It was in pristine condition, really. I sayang my car very much…took good care. Had to sell it to a used car dealer at not so competitive price. Why not keep the other car as back up? And Melissa can drive around town in it, though not outstation. The tuition centre in your first photo – I used to work for their KL location a long time ago. I think they’ve gone out of business though. Oh? The same owner? They have a branch in Kuching, that I know, run by the sister or something. Just heard the other day that it is up for sale as the owner would like to give up the business and retire. Nice 2nd car you have there! Old, very old, both of them but thankfully, they’re running fine. Pingback: Envy… | ...Still crazy after all these years! Pingback: House in the woods… | ...Still crazy after all these years! Pingback: While I wait… – …STILL CRAZY AFTER ALL THESE YEARS! Pingback: Makin’ me look good again… – …STILL CRAZY AFTER ALL THESE YEARS!